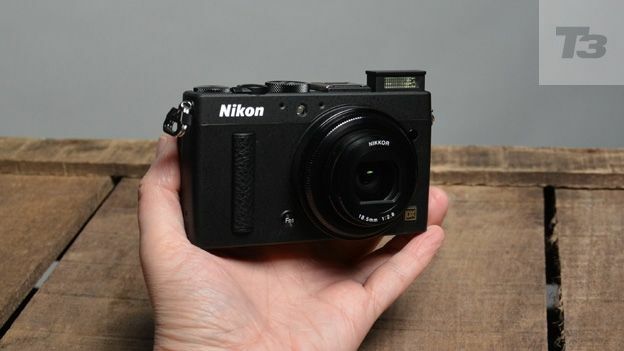 The Nikon Coolpix A is the latest high-end snapper to join the brand's digital compact camera lineup, bringing with it a DSLR-grade sensor. The fixed lens snapper is set to do battle with the likes of the Leica X2, Sony RX1, Panasonic LX7 and the Canon G1 X to make it into our list of the best digital compact cameras around. The fact that the new cam sports the same chip as last year's Nikon D7000 makes it the smallest camera to feature Nikon's DX-format CMOS sensor. But is the £1000 price tag too much for even the most dedicated street photographer? We were instantly taken with the design of the Coolpix, with the metal chassis giving it a decidedly premium look and feel. It might not have the retro styling of the Fujifilm X100S or the Samsung NX300, but the minimalist aesthetics are very slick indeed. Weighing in at 299g (including the battery and a memory card), the Coolpix A is heavier than most standard compacts but stacks up pretty well again its main rivals, such as the Fujifilm X100S, which tips the scales at 405g. With dimensions of 111.0 x 64.3 x 40.3mm, it's small enough to tuck into a pocket or manbag. The raised, textured grip on the the front of the body, teamed with the textured thumb grip on the top right-hand panel of the back panel means that the camera is comfy to hold and also gives you plenty of grip if you're shooting one-handed. The relatively wide angle 28mm f/2.8 equivalent lens extends from the camera body when you fire up the cam, but don't be fooled - there's no zoom on board - this is a fixed lens affair. The top of the camera is home to a mode dial with DSLR-style settings including Aperture Priority and Shutter Priority along with two options that can be configured with your own chosen settings. Next to this you'll find the shutter release button which is surrounded by an on/off lever. You'll also find a rear thumb dial plus a neat pop-up flash and a hotshoe adaptor for attaching an optional flashgun or viewfinder. The back panel features a fairly standard set of Nikon ctonrols, including the playback and Menu buttons, clickwheel and the 'i' button which fires up the Nikon settings screen. You'll also find the all-important focus mode switch on the left-hand edge of the snapper. This enables you to toggle between auto focus, manual focus and the macro mode. The manual focus ring surrounds the lens and offers fluid motion for getting your shots into focus but we found that it was a little on the narrow side, with not much to grab hold of. The Coolpix sports a fixed 3-inch LCD display with a thoroughly decent 921-K resolution. Obviously it's not as high as those found on the company's DSLRs, but it certainly does the job. It features an anti-reflective coating which we found worked reasonably well, although we weren't shooting in terribly bright sunshine (blame the British Springtime). A tilted screen might've handy but then it would probably mess with the svelte design. As mentioned earlier, the Coolpix A sports the same 16.2-megapixel APS-C sensor that appears in the brand's D7000 DSLR. Although the A doesn't feature the newer sensor that appears on the updated Nikon D7100, the low pass filter has been dropped which means that images are super sharp. It's also interesting that the new compact uses Expeed 2 processing engine, rather than the newer Expeed 3 processor. However, the slightly older technology certainly hasn't had a negative impact on the clarity of images that the Coolpix A produces. While picture quality is excellent, we found the auto focus to be disappointingly sluggish and certainly a lot slower than we'd expect for a camera that costs just shy of a thousand notes. However, when the AF is playing ball, the images really are superb. Experienced snappers will also be pleased that they'll be able to shoot in RAW as well as JPEGs. It could also do with a close-up view of the focal point for the manual override when shooting in AF mode for tip-top sharpness. At the moment, the zoom in and out buttons only work before you've focused on the subject, which isn't a great help. The Burst mode is pretty good, offering a capture rate of 4fps, while the Macro mode is excellent with a 10cm minimum focus distance which offers splendid close-ups from the 28mm lens. The camera has an ISO range of 100-6400 and, as we'd expect, picture clarity decreases slightly as you whack the setting up to the upper end of the scale. You'll find the usual array of shooting modes, including Landscape, Portrait and Sports along with a collection of filters, such as monochrome and sepia and effects including fisheye and minature. There's also a decent video mode that can capture footage at 1080p at a rate of up to 30fps. Powered by a rechargable Li-ion EN-EL20 battery, the Coolpix A is quoted as offering up to 230 shots per charge. We managed several days out of the a single charge before needing to top up the battery, so we have no complaints there. On first glance, we loved the design of the Nikon Coolpix A and had high hopes for what it is, to be frank, a flamin' expensive compact. This camera should be a street photographer's dream, but the slow pace of the auto focus means that it doesn't quite deliver as it should. The upside is that picture quality is simply fantastic. It's difficult to fully recommend at this price, as it's a lot more expensive than many of its similarly specced rivals but picture quality is simply excellent.